Spotted at Eurobike! Fox Live Valve electronic suspension! These days at Eurobike, journos often get a head start on what’s going to be new at the exhibition. We start getting emails months beforehand, with a head’s up of what’s coming and what deserves our immediate attention as soon as those hall doors open on Day One. There’s a lot of product on show at Eurobike, so brands do whatever they possibly can to make sure we come and see them first. It’s nice not getting spoon fed that kind of information though, and it’s amazing what a good old wander through the halls can bring up as far as new and exciting product. And today I struck gold while perusing the Scott Sports booth. I was initially looking for the adjustable ramp control that Scott is spec’ing on the 2019 Genius range (more on that soon), but then I spotted an unusual looking Fox shock on the top-end Genius 900 Ultimate. Once I got up close though, it was clear that this was Fox’s brand new Live Valve rear shock and fork – YES! Scott Sports has its 2019 mountain bike lineup on display – including this Genius 900 Ultimate, with a suspicious looking shock. No idea what I’m talking about? Well allow me to do my best speculative explanation for you. 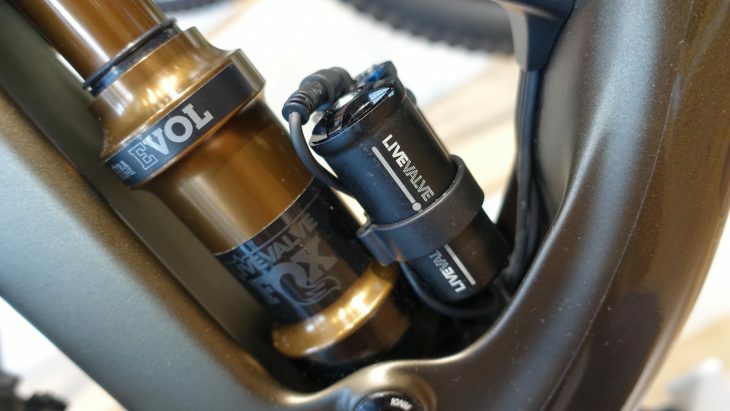 Fox’s Live Valve system was first shown in the wild about three years ago, and in essence, it was said to offer electronically controlled damping for both the fork and rear shock. 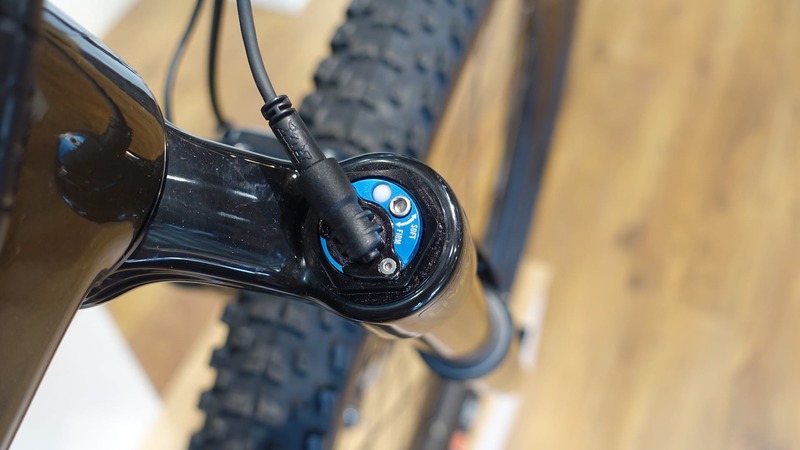 With a series of sensors including accelerometers on the fork lowers and the rear dropout, a computer system determines what level of damping both the fork and shock should have. 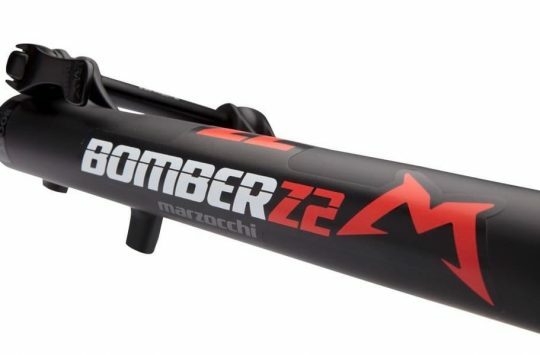 So in theory, you could have the rear shock nice and firm while you’re pedalling, and wide-open for the descents – with the suspension performing those adjustments by itself, without the rider having to flick dials or twiddle knobs. 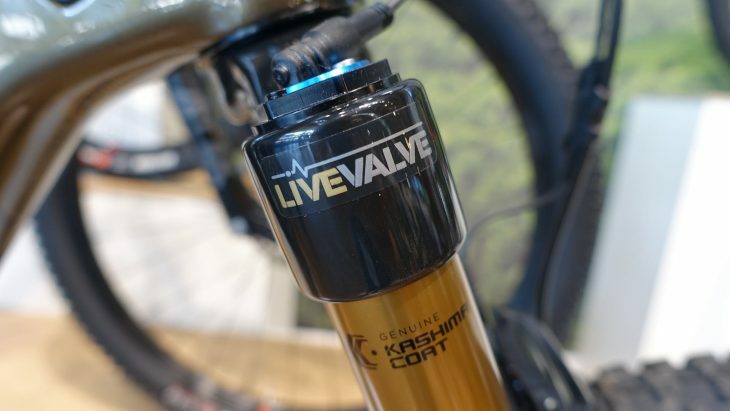 We haven’t heard a peep from Fox since that early version appeared, though more and more mountain bike frames have been offering ‘Live Valve compatibility’ over the past 18 months (including the Giant Anthem, Pivot Mach 5.5, and the Rocky Mountain Altitude), signalling the electronic damping system’s inevitable arrival. 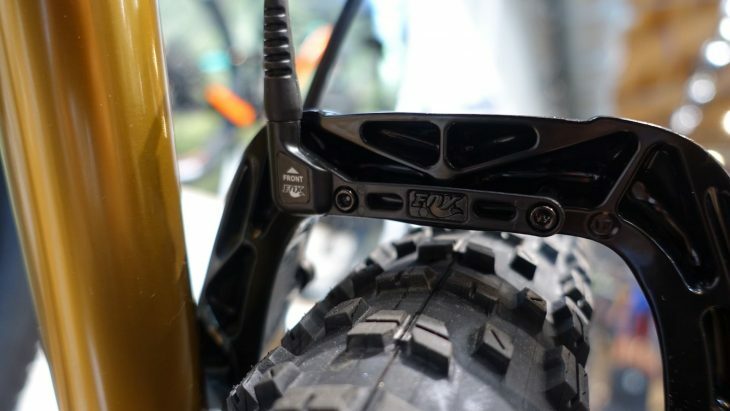 The rear shock is based upon Fox’s Float DPS unit, with an EVOL air can and a fancy Kashima coating. At the top of the shock head are two barrels that presumably house the Live Valve damper. There’s a blue dial with a small allen screw that has ‘Soft’ and ‘Firm’ etched onto it, which is presumably to provide external adjustment of the compression damping, likely independent to that of the automated damping control. The Genius had a simple battery cover in place (instead of a real battery), which is held on by a latch on either side. This is likely so that the battery can be removed for recharging. Latches secure the battery in place onto the main unit, which my guess is where the brains of the system lie. If you look closely you can see the extended bracket that the battery housing uses to mount onto the bottle cage bolt. There are four wires coming out of the head unit. Two of those cables go up to the bike’s head tube. One fits onto the top of the fork’s damper, on the crown of the right hand fork leg. Again, there’s a small allen bolt with ‘Soft’ and ‘Firm’ next to it, which suggests another external compression damping adjustment. Live Valve damping within. But what will it actually do on the trail? The other wire up front extends down to the back of the fork arch, where a small sensor is bolted to the threaded eyelets on the magnesium lowers. I’m guessing this is an accelerometer of sorts, which will measure the speed and force of impacts hitting the front wheel. 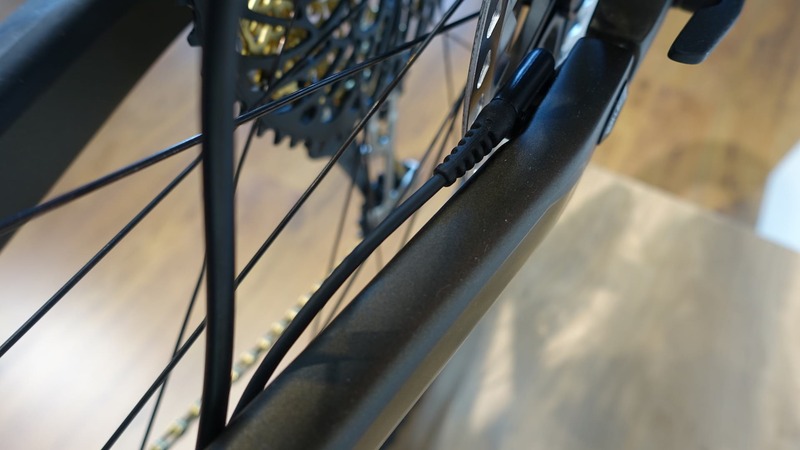 The rearward cable winds its way to the back of the non-drive seat stay, where it meets another sensor. 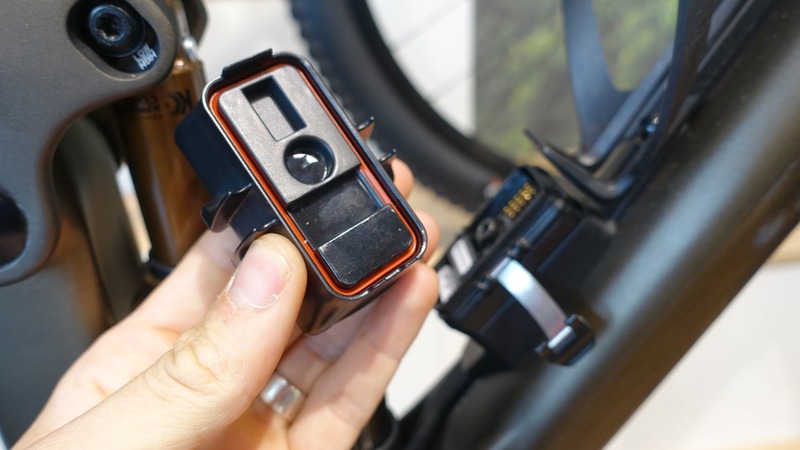 This is likely another accelerometer that measures bump forces on the rear wheel. Information from those two sensors then comes back to the head unit, which then works some voodoo magic to tell the fork and rear shock what to do. 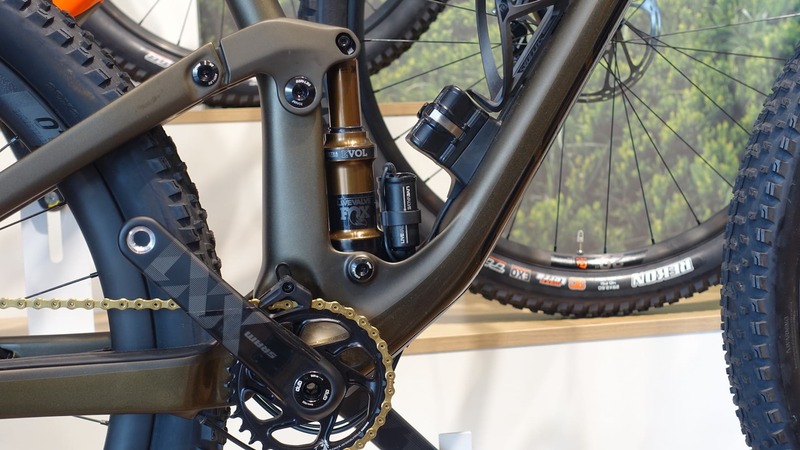 As to how the rider will be able to setup and adjust the Live Valve system and how much of a benefit it will provide them on the trail? 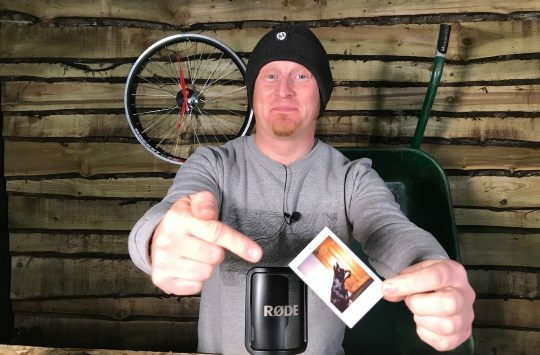 I’ve got no idea, but if it’s like everything else electronic these days, then you’ll probably be able to pair it with an app on your phone to tell the suspension what you want it to do. 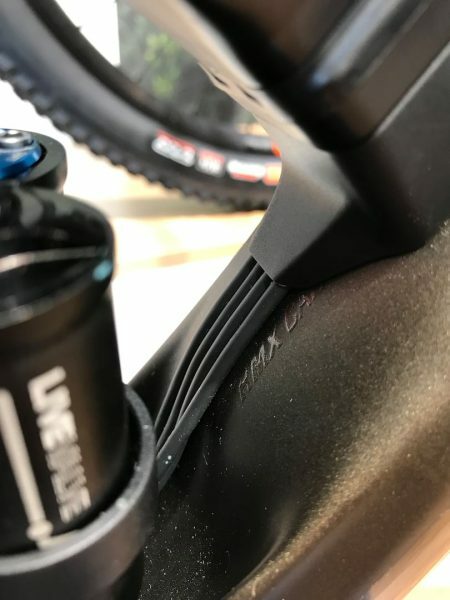 Of course RockShox had a similar concept with the e:i system used in partnership with Lapierre, Ghost and Haibike a few years ago, and the idea was to improve pedal efficiency by automatically adjust the shock’s compression damping based on input from an accelerometer on the fork (to measure the bump force), a crank sensor (to detect pedalling), and a speedometer (to measure riding speed). Later versions of e:i worked really well (I tested e:i Auto and thought it was highly effective), but unfortunately e:i faded into obscurity – likely because of the added expense, but also because of the poor durability issues that earlier versions suffered from, and the resulting PR damage that did. 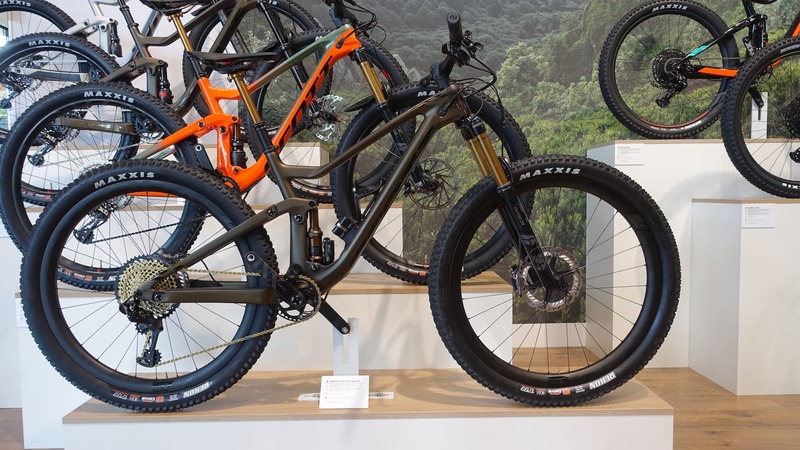 Mountain bikers are traditionally wary of electronics on their bikes, so it was also likely a tough sell for dealers when customers could get the same bike without the electronic suspension for considerably less. 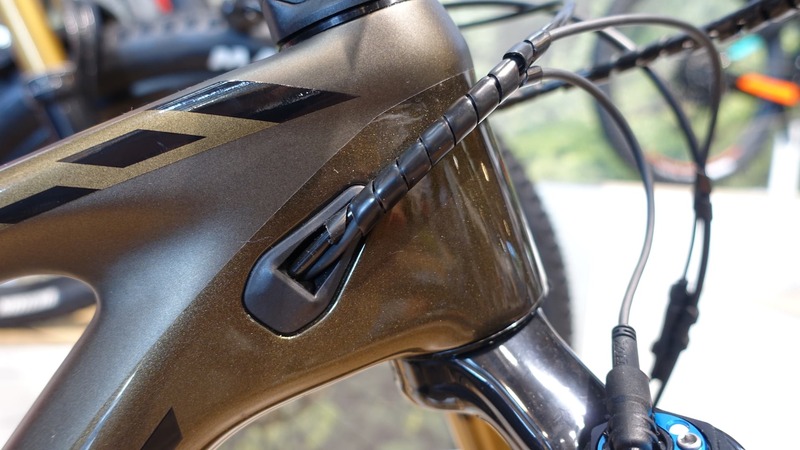 Regardless of those barriers, Fox appears to have been working on its own version of electronically-controlled suspension damping, and given the look of this unit on the Genius I saw at Eurobike, it appears to be very close to production. Fox Live Valve is apparently coming this August. Update: So according to this poster at the Fox booth, Fox Live Valve is going to be coming in late August of this year – so a little over a month away. If the poster is to be believed, the system will come with its own LED lazer lights that will light up your bike like an X-ray machine. Or not. But it would seem that our earlier detective work is on the money. 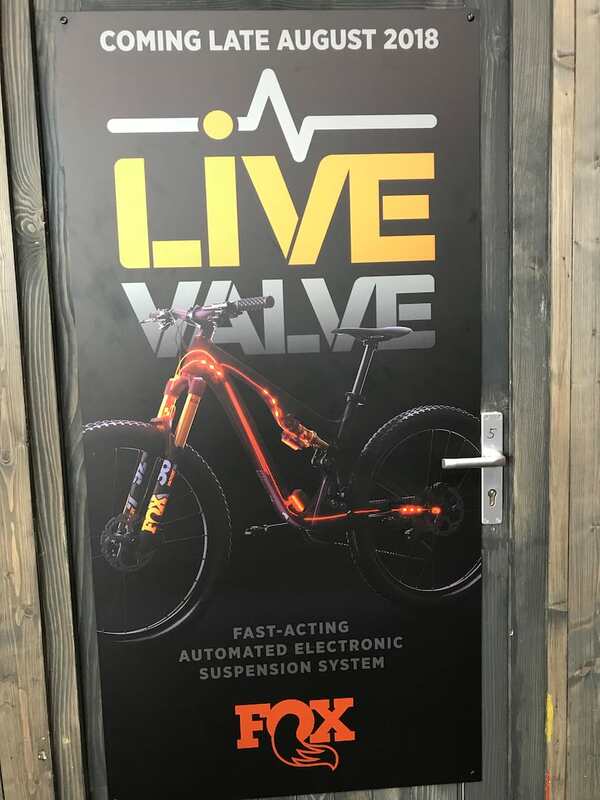 Fox’s poster states that Live Valve is a “Fast-acting automated suspension system”, so it’ll all be about having the fork and shock controlled by way of electronic sensors. 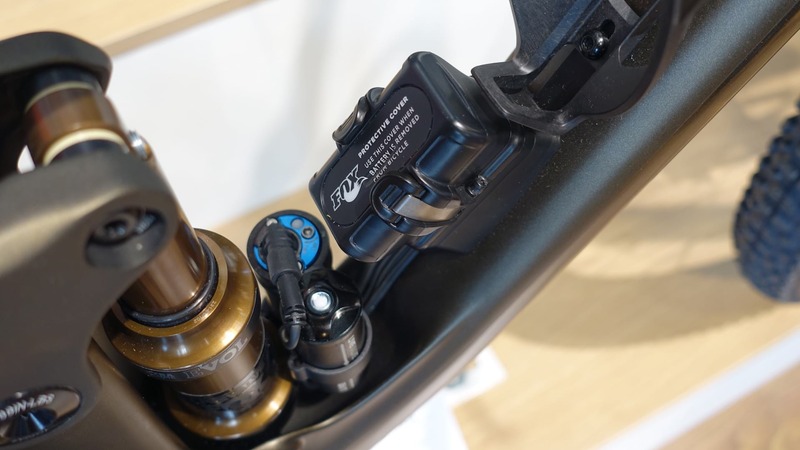 On the image in the poster, there’s clearly a sensor on the fork lowers and on the rear dropouts, along with a battery pack that mounts just behind the bottle cage bolts. Presumably the system’s brain sits with the battery pack, and sends out its orders to both the fork and shock. So what do you guys think of this Live Valve business? 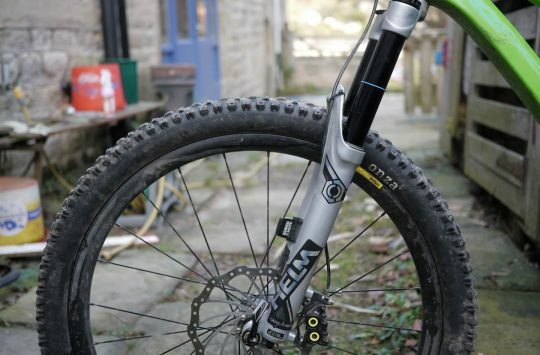 Were you a fan of the RockShox e:i system and sad to see it disappear? 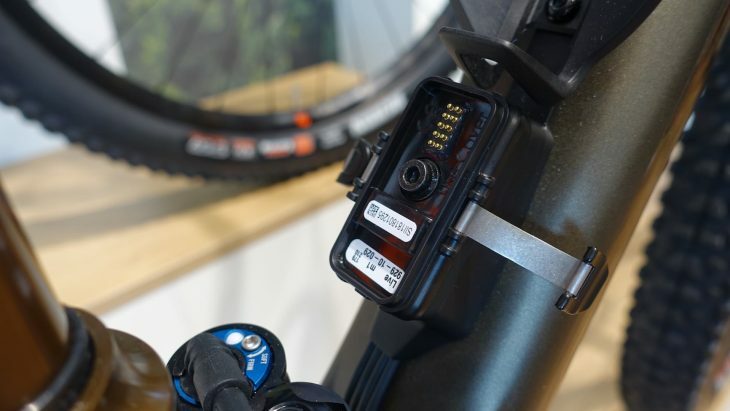 Or would you prefer to have zero electronic devices with you while riding (well, aside from your phone, watch, fitbit, GPS computer, e-MTB motor, electronic shifting etc…)? This Sterling Silver Orange Five XTR Is Stunning! An on board Shockwiz constantly adjusting your suspension sounds like a good idea. Like all these things it’ll come down to durability in real world UK riding for most riders, though. Even more cabling on a Scott? Who’d have thought it possible? !